The Chairman of the Board, generally, takes the chair. If there is no Chairman of the Board or he is absent a director is elected as the Chairman of the meeting. Where there is no regular Chairman, Chairman may be elected at and for each meeting. 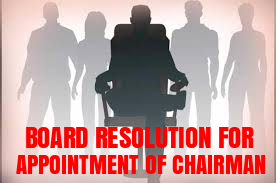 In the absence of a provision in the Articles for appointment of the Chairman the director presiding over the meeting does not have the legal status of the Chairman of the company, he is only Chairman of the meeting. RESOLVED THAT pursuant to article __ of Articles of Association of the company Shri ___________ Director of the company be & is hereby appointed as a Chairman of the Board of Directors with effect from ___________ and he shall remain as Chairman unless otherwise decided by the Board." FURTHER RESOLVED THAT ___________ be and is hereby authorized to take all necessary actions to implement the above decision of the board.